The Metro Manila Development Authority (MMDA) re-implemented the no-contact traffic apprehension policy, also known as "Huli Ka! You're on CCTV Camera", all throughout Metro Manila on April 15. MMDA Chairman Emerson Carlos said in a recent meeting with Metro Manila bus operators and owners that the policy was put in place "to instill discipline among the motorists". According to MMDA, the policy utilizes CCTVs, digital cameras, and other technology to record or capture videos, images and license plates of vehicles violating traffic laws, rules and regulations. Private and public utility vehicles will be monitored via hundreds of CCTVs which are now placed in strategic places in the metropolis. MMDA will install a total of 650 cameras in support of the policy. So far, 250 cameras are already in place. Take note, these are high definition cameras which can zoom in on the license plates and can take clear images even during the night. For drivers who think they can get away with violations because of dark surroundings, good luck! At the MMDA Metrobase, there will be a team (currently composed of 15 members) that will monitor the CCTV footages for traffic infractions. To search for the motor vehicle records of violators, MMDA will coordinate closely with the Land Trasportation Office (LTO). MMDA will then send a summons or notice to the vehicle owner or operator, to know the driver of the vehicle at the time of the traffic violation. The notice will be sent via personal delivery by MMDA personnel, by registered mail, or through courier services. The notice will include details such as date, time, location and type of traffic violation. It will also be accompanied by photos regarding the violation. The notice can be contested by the motorist at the MMDA Traffic Adjudication (TAD) within seven (7) days upon receipt of the summons. If the motorist receives an adverse ruling from TAD, he or she can then file a motion of reconsideration (MR) within 15 days of the TAD ruling. If the MR is denied, the motorist can file the appeal at the Office of the Chairman, whose decision will be final and executory. If the motorist fails to contest the violation 7 days after receipt of the first notice, a final notice will be sent to the owner of the vehicle. Failure to pay the fine upon receipt of the final notice will result to the inclusion of the violator's license plate in the Alarm list which will then be forwarded to the LTO. Until all the fines are settled, the motorist will not be able to renew the vehicle registration. What then would be the role of traffic enforcers upon the implementation of the no-contact traffic apprehension policy? 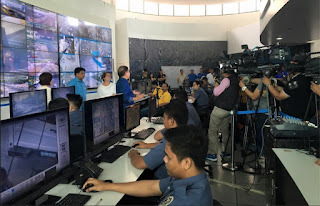 MMDA Traffic Enforcers will still be present on Metro Manila roads since the policy was designed to catch moving violations and to supplement the work done by the traffic enforcers. MMDA constables will still apprehend violators of administrative offenses. Besides, not all traffic violations can be seen on CCTVs. Think of violations like drunk driving, driving without a license, colorum operations, out of line, and others. On the first day of the implementation of the no-contact apprehension policy, 24 Oras of GMA Network reported that more than 200 tickets for traffic violations were printed. Most of the violators were bus drivers.